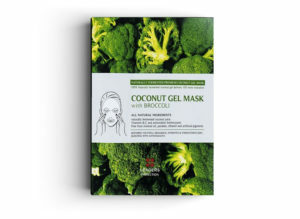 This natural coconut gel mask with broccoli extract conditions the skin leaving it fresh and glowing. Vitamin C and Beta-Carotene rich broccoli extract softens and soothes the skin, rejuvenating it’s youthful appearance. Broccoli extract protects skin from harmful environmental irritants while clearing pores and maintaining a clean and fresh complexion. Recommended for skin prone to acne and frequent breakouts, oily skin, and sensitive skin.